Have I mentioned before how obsessed I am with Valentine's Day? Like, scary amounts of obsessed. Geoff rolls his eyes at me every time they set up the Valentine's displays in the store, because I have to look at each and every item and exclaim over how cute it is. If I had my way, I would decorate the whole house in pink and red hearts every year for V-day. Since I don't think Geoff could tolerate that, I usually settle for a cute wreath on the front door and maybe a heart garland across the top of the bookcase. I'm not even sure where my love of Valentine's Day came from (it might be because it's only a few days before my birthday), but whenever I start seeing all those garish, goofy, over the top lovey decorations, I am just filled with joy. I buy each of the girls a new book for Valentine's Day (usually something love-related) and cute treat, and Geoff and I usually try to carve out some time in the week to do something fun together. 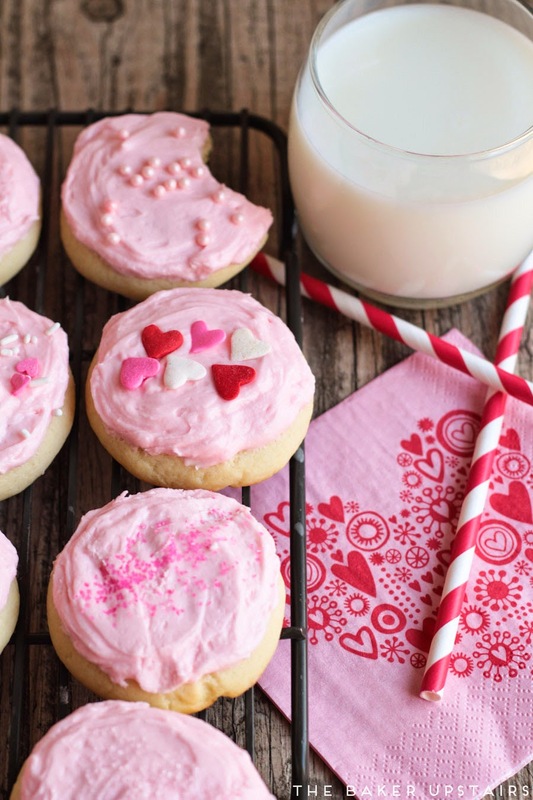 In addition to my love of Valentine's day, I also have a love of thick, soft sugar cookies. 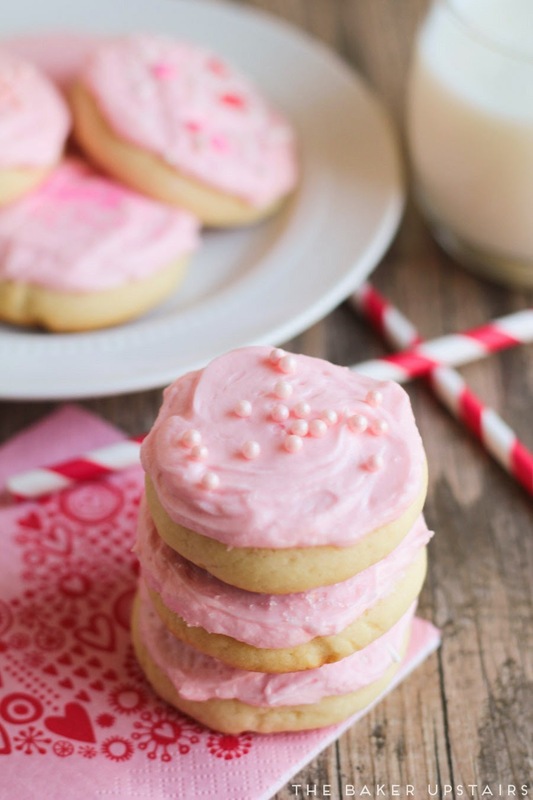 I find them completely irresistible, especially if they are topped with a thick layer of pink icing. This recipe is a kinda-sorta copycat of the cookies that you can buy at the grocery store, only much better and more flavorful. 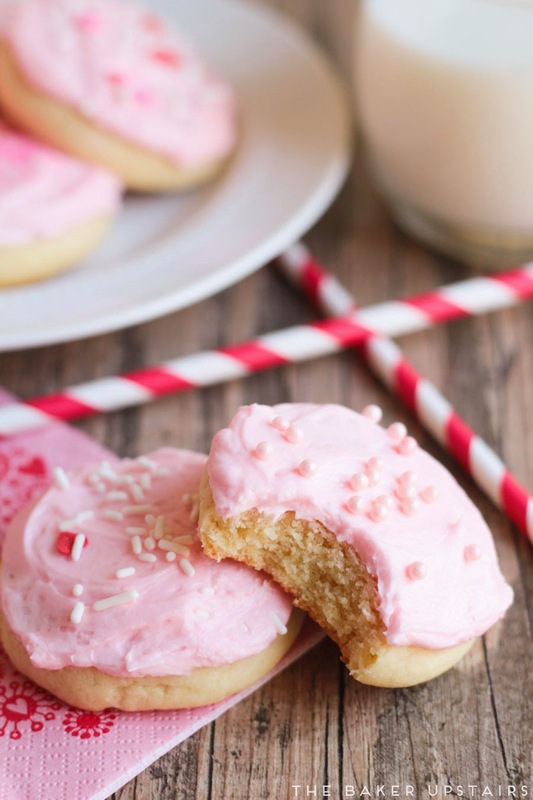 The store-bought cookies tend to be a little on the bland side, but these cookies taste like butter and sugar and vanilla and have a delicious sugar cookie flavor! I love that by making balls with the dough instead of rolling it out, the prep time for these cookies is significantly shortened. They really are so quick to throw together, and made with super simple ingredients. 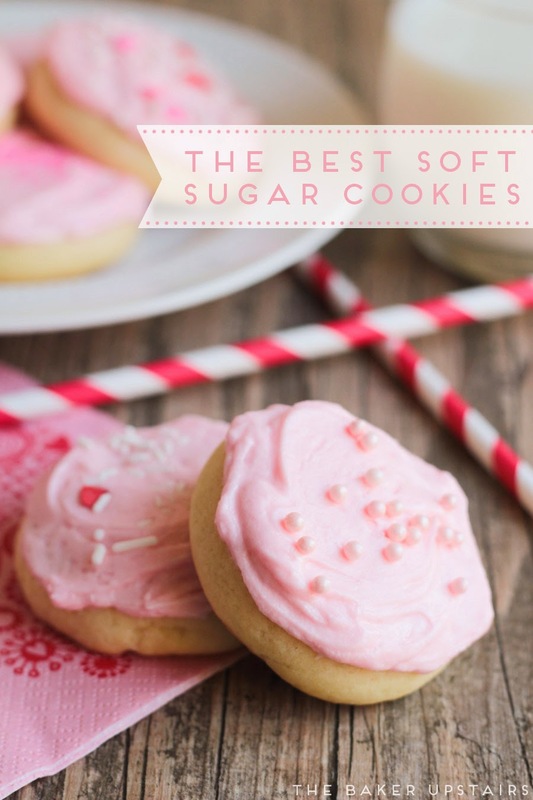 As a sugar cookie lover, I have made and tasted a lot of different sugar cookies in my life, but I would definitely say these are among the best I've ever tasted. Just looking at the pictures is making me want to bake another batch post haste! In a large bowl or the bowl of a stand mixer, beat together the butter and sugar until light and fluffy. Add the eggs one at a time, followed by the vanilla, and mix well. Add the flour, baking powder, and salt, and mix until a firm dough forms. Chill 30 minutes. To make the frosting, beat together the butter and powdered sugar. Add the vanilla and enough milk or cream to thin to desired consistency. Beat until light and fluffy. Add the food coloring and beat until well distributed. 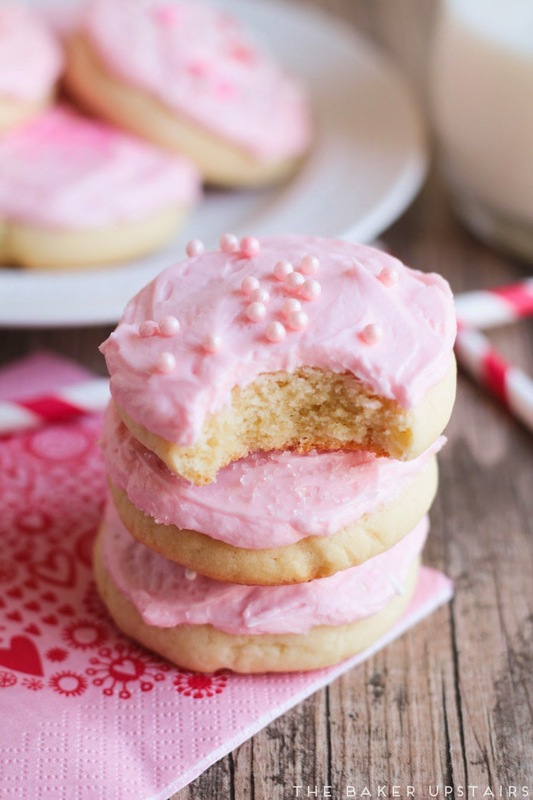 Frost cookies as desired. If there's one type of food that screams "comfort food" to me, then it is definitely noodles. My mom made a lot of noodle dishes growing up, especially during the cold months, and I have many happy memories of sitting around the dinner table with my family and enjoying noodles together. I'm the second of five children, and we ate dinner at home together as a family nearly every night during my growing up years. The dinner table was a great time to get caught up on everyone's happenings and to stay close as a family. As a busy mom myself now, I am doing my best to continue the tradition of family dinners with my own family. Between work, school, and activities, though, I depend on quick and healthy meals in order to make that happen, and using No Yolks® noodles makes it easy! 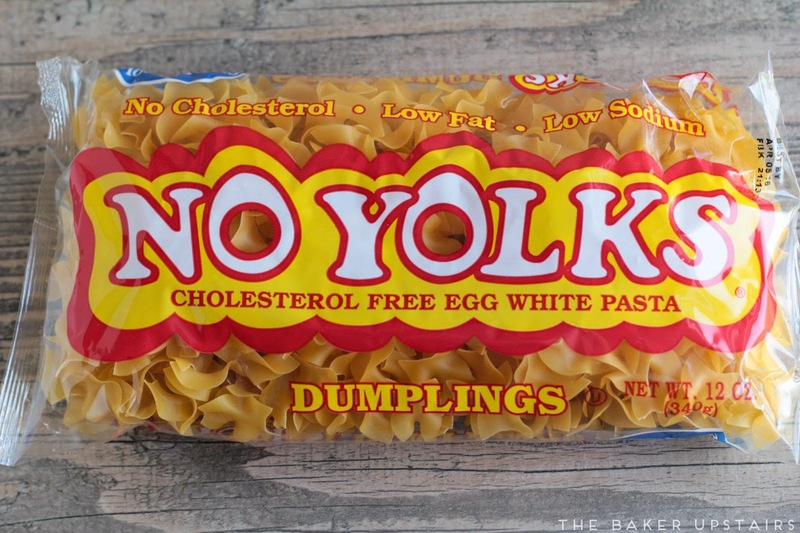 If you're not familiar with No Yolks® noodles, they are cholesterol free and always smooth, firm, and delicious. They are simple and easy to prepare, and cook consistently well every time. I also love that they don't have any artificial colors or preservatives. They also have a new whole grain version, which I am excited to try. 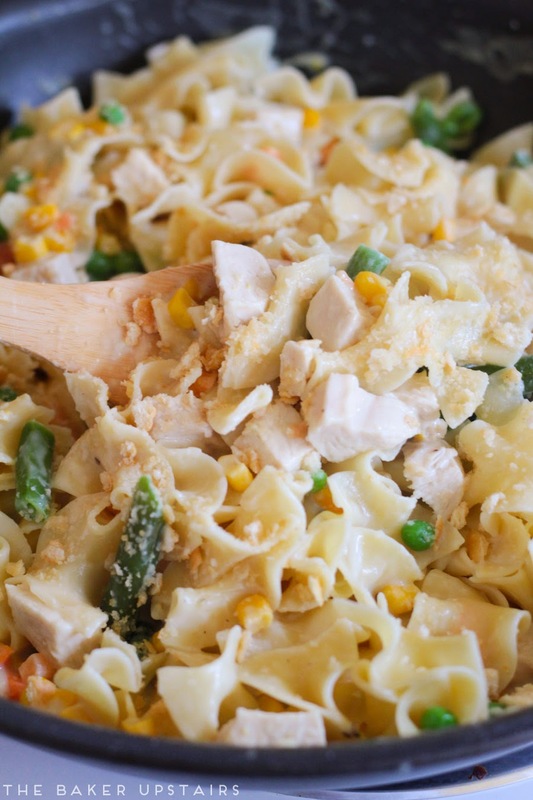 I used them to make this delicious chicken pot pie noodle skillet, and it turned out fantastic! 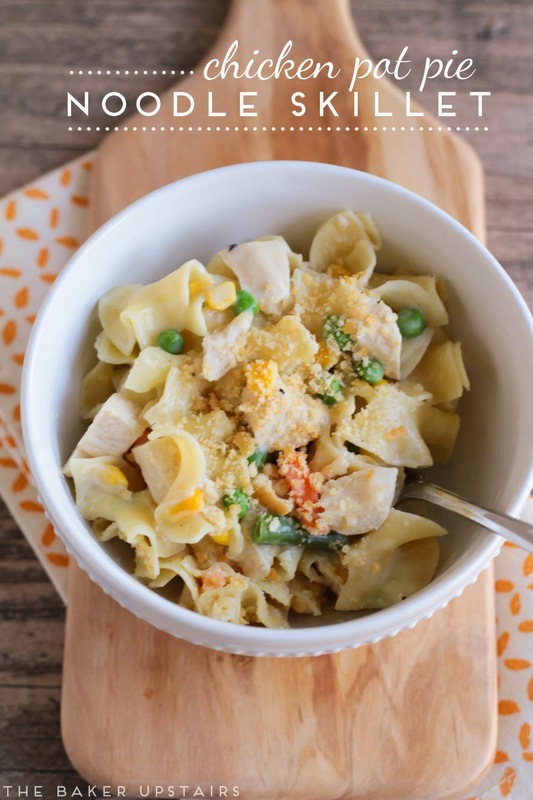 I made a creamy, flavorful sauce with tender chunks of chicken and vegetables, then tossed it with the cooked No Yolks® noodles and sprinkled it with a buttery cracker topping. All of the delicious tastes of pot pie in a homey, comforting skillet that's ready in under thirty minutes. What more could you want? Cook the noodles according to the package directions, then drain and set aside. While the noodles are cooking, melt the butter in a large skillet over medium heat. When the butter is melted, whisk in the flour to form a paste. Let cook 2-3 minutes until golden. Gradually add the milk, whisking so there are no lumps. Let cook for a few minutes until thickened, then gradually add the chicken broth, continuing to whisk constantly. Whisk in the salt and pepper, then let the mixture cook for a few minutes, until thickened to desired consistency. Stir in the chicken and vegetables and cook until heated through. Toss with the cooked noodles until well combined. In a small microwave safe bowl, melt the 1 teaspoon butter. Toss with the cracker crumbs to coat evenly, then sprinkle over the noodle mixture. Serve warm and enjoy! I would love to hear about your favorite comfort food using No Yolks® noodles. Leave a comment below for a chance to win a $100 Visa gift card! 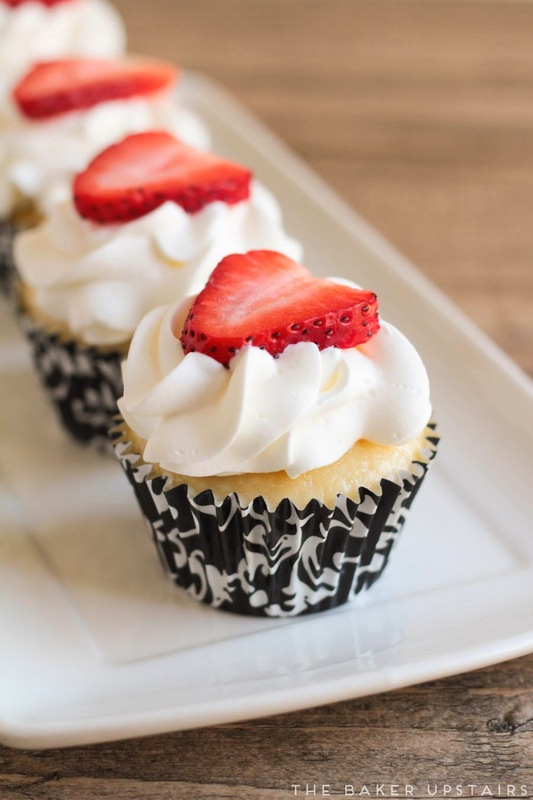 Tres leches cupcakes. Seriously. I made these for my mom's birthday party on Sunday, and they were delightful! Every year my dad gets all of my siblings to work together to make dinner for my mom, and this year we had a mexican theme. My sister and brother in law made chicken fajitas, my brother made some awesome guacamole, and I made my favorite mexican rice and these tres leches cupcakes. It was a delicious dinner and I ate way more than I should have, but it was totally worth it! I'm pretty obsessed with tres leches cake, and Geoff and I order it any chance we get. We are lucky enough to live close to a Cafe Rio restaurant, and I am in love with their tres leches. These cupcakes aren't exactly the same, but they definitely have that delicious tres leches flavor and are so pretty, too! I love making cupcakes, especially for parties, because they're perfect portion sizes and nobody gets stuck with a corner piece or middle piece when they want the opposite. 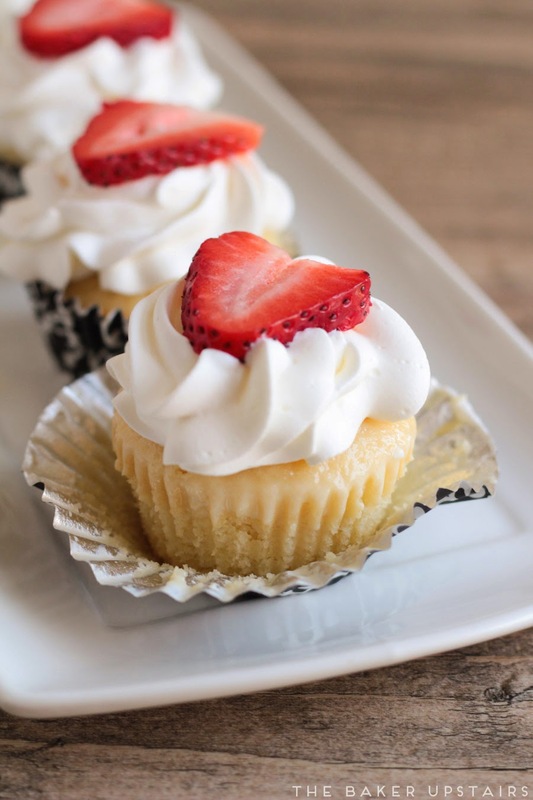 These cupcakes are so moist and flavorful, topped with lightly sweetened whipped cream and fresh strawberries. So, so good! 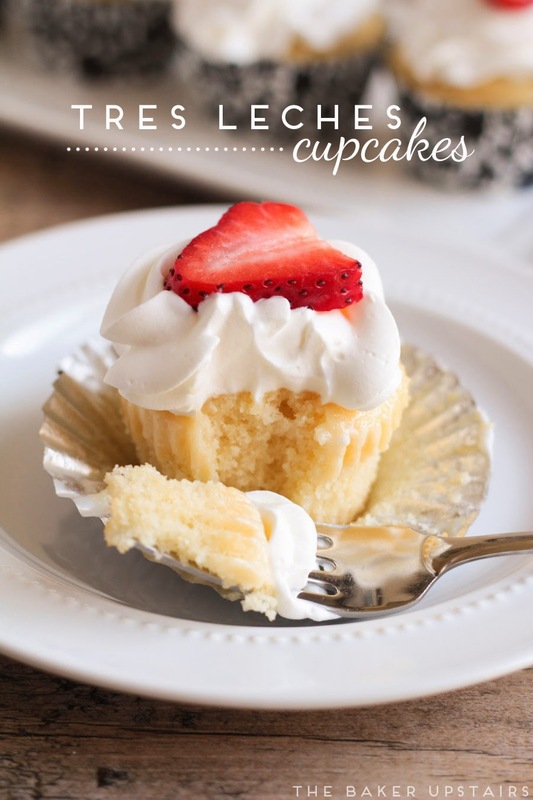 A few tips: making these cupcakes is a messy job! I used the Reynolds Stay-Brite cupcake liners, and I felt like they held up really well to the milk mixture. Foil liners would also work well. I would definitely not recommend using just paper liners, since they will get soggy and fall apart. This recipe would also work great as a 9 x 13 sheet cake. Pierce the cooled cupcakes multiple times with a skewer (being careful not to pierce through the wrappers). In a large bowl or measuring cup, whisk together the sweetened condensed milk, coconut milk, and half and half until well blended. Place the cupcakes on a baking sheet (to catch spills) and ladle the milk mixture over each cupcake. Refrigerate for 30 minutes, then ladle more of the milk mixture over each cupcake. Refrigerate until ready to serve (at least another 30 minutes). When ready to serve, beat the whipping cream until medium peaks form, then add the powdered sugar and mix until well combined. Spoon a dollop of whip cream on each cupcake (or pipe them if you're a nut like me) and top with a strawberry slice. Refrigerate any leftovers. Enjoy! This last week I did something I have never done before: I ate a hot breakfast every single morning of the week! I know that's probably no big deal for anyone else, but I'm usually busy in the mornings and running out the door, grabbing whatever random items I see… yogurt, bananas, granola bars, trail mix, etc. Last week, though, I decided to plan ahead and made a batch of these muffins and some sausage and cheese biscuits (recipe coming soon! ), and I had a super easy breakfast ready for me every morning! Since I am apparently incapable of doing two right things at the same time, I did end up eating out for lunch a couple of days this week, but it's a start. Right? 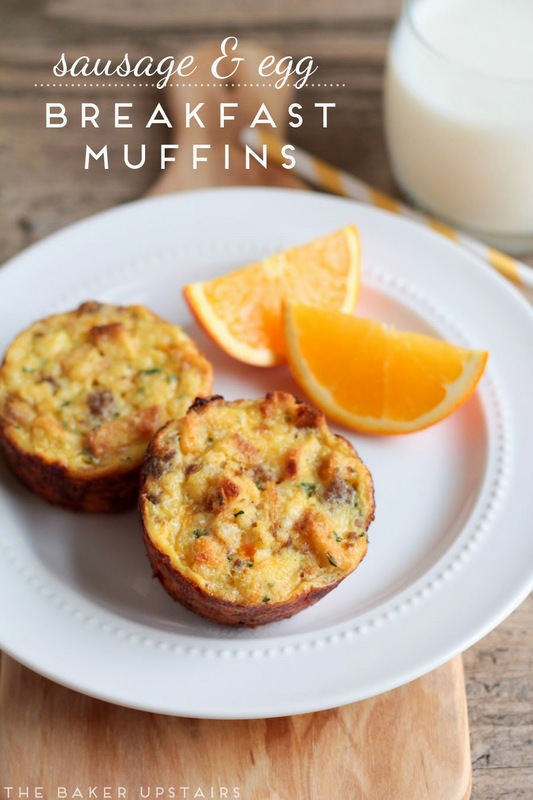 Anyway, these sausage and egg breakfast muffins are super easy to make, and so delicious and flavorful. They were a big hit with my whole family! I've still got about half the batch waiting in the freezer, and I'm excited to continue my trend of hot breakfasts this week. Yum! Preheat the oven to 350. Prepare muffin tins by spraying with cooking spray. In a medium bowl, whisk together the eggs, milk, and salt until well blended. Stir in the cheese, sausage, bell pepper, and stuffing mix, and mix well. Scoop into prepared muffin tins, filling nearly full. (Mine made 18 muffins.) Bake 20-25 minutes or until they no longer jiggle when the muffin tin is gently shaken and the muffins are light golden brown on top. To freeze, let cool completely then place in a freezer-safe container. Reheat two muffins on a paper towel at 50% power for 1 minute, then full power for 1 minute. Enjoy! 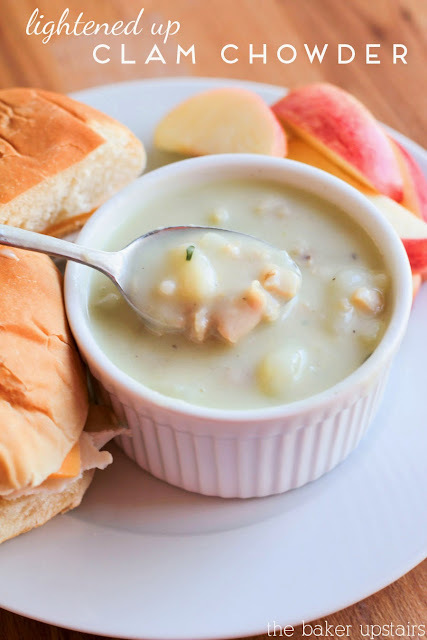 I'm totally all about the easy meals lately, and this lightened up clam chowder is about as easy as it gets! It comes together in under thirty minutes, and is so simple to make. I love to eat soup all winter long, and this one is hearty and delicious, but still light. Both of my kids loved it, which is really saying something, considering they've never consented to eating clams before. It was a perfect cozy meal for a cold winter night! Pierce the potatoes with a fork and microwave until cooked through (this took about 11 minutes on my microwave). Remove and let cool, then peel and cut into small pieces. In a large pot, melt the butter over medium heat. Add the flour and whisk to form a smooth paste. Let cook 2-3 minutes, or until golden brown. Slowly whisk in the milk and reserved clam juice, stirring constantly to prevent lumps. Continue to cook over medium heat until thickened and bubbling. Stir in the clams, potatoes, salt, pepper, and parsley, and cook until heated through. Adjust seasonings as needed and serve. Can we all just agree that we've reached that part of winter already where it's no longer magical? I spent the whole day yesterday inside with my stir-crazy three year old while it rained steadily outside and then turned to snow. I hate the long bundling up ritual that must occur before we can leave the house, and I'm so tired of the gloomy gray days. Last week I paid $6.99 for a package of strawberries just so I could have a little taste of spring (yes, that's how desperate I'm getting). I've been trying to find ways to occupy our time and stave off cabin fever on the winter afternoons, so my seven year old and I have been doing a lot of cooking together. She really wanted to make dinner a few nights ago, so I laid out all the ingredients to make these delicious taco cupcakes, and she assembled them and did a great job! 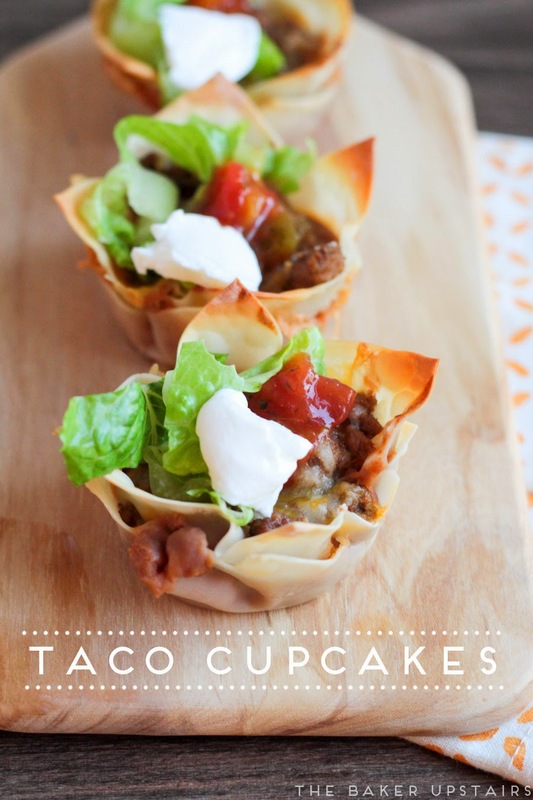 These taco cupcakes are super tasty and cute to boot! 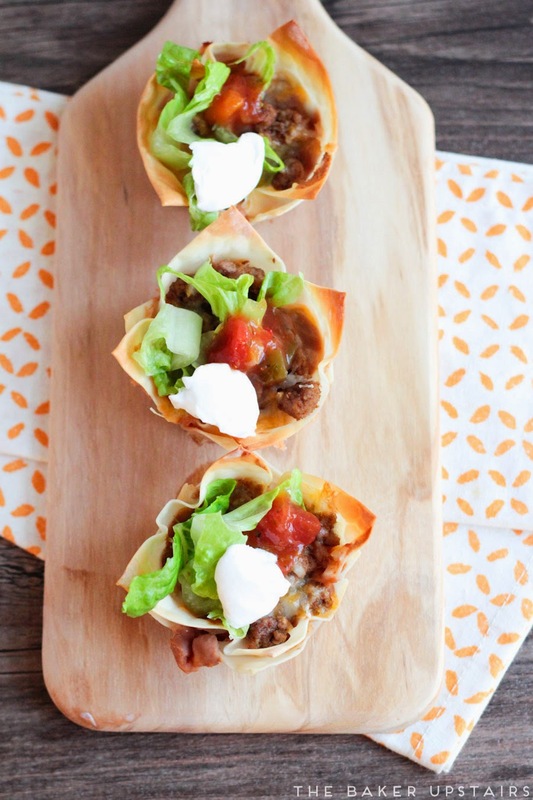 We've all been crazy about mexican food lately, and these are a fun twist on one of our favorite meals. My kids loved these and Abby was super proud of herself for doing such a great job making dinner! Preheat the oven to 375. In a large skillet over medium heat, cook the ground turkey until cooked through, breaking it up gently as it cooks. When the turkey is cooked through, stir in the chili powder, cumin, and garlic powder and mix until blended. Spray 18 muffins cups with cooking spray and place a wonton wrapper in each cup. Add a spoonful of refried beans and a spoonful of ground turkey to each cup, then sprinkle with cheese. 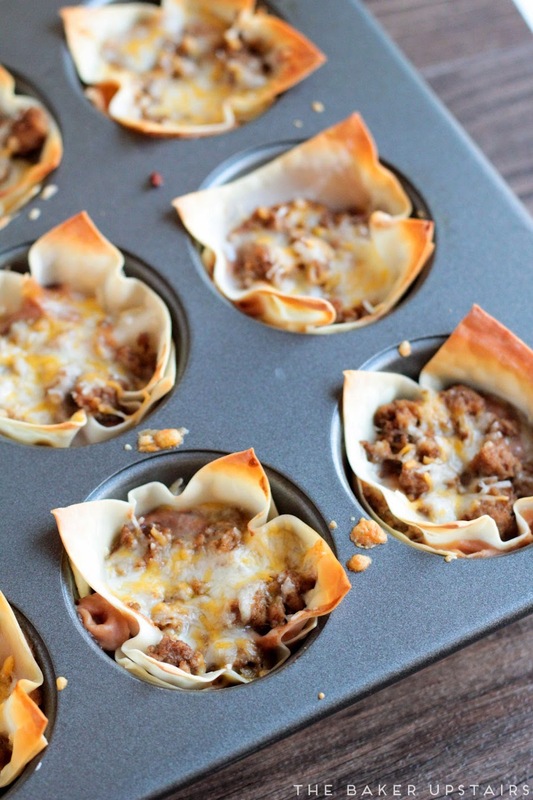 Layer another wonton wrapper on top of each cup and repeat the layers of beans, ground turkey, and cheese. Bake 15-18 minutes, or until golden brown. Top with lettuce, sour cream, and salsa. Um, so these asian lettuce wraps are awesome. I'm just going to get that right out there in the open. Lettuce wraps are one of my favorite foods, and Geoff and I order them pretty much every time we visit California Pizza Kitchen. I love the contrast of flavors and textures and the freshness from the juicy lettuce. I could seriously eat them at least a few times a week if Geoff would stand for it, but I haven't had a good recipe for making them at home, until now! 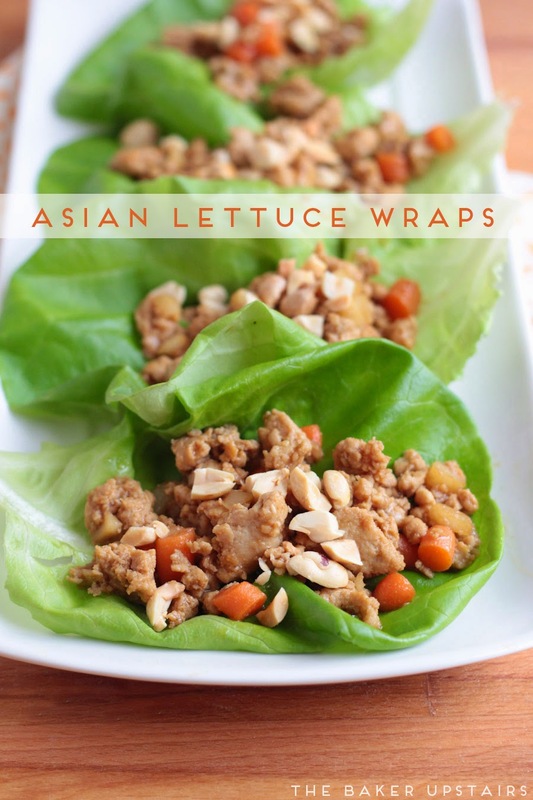 These lettuce wraps could not be easier to make, and are so full of flavor! My kids loved them (although Lizzy refused to touch the lettuce and insisted on eating her chicken with chopsticks) and Abby asked if we can have them for dinner every night (which is always a good sign, coming from her). I've never cooked with hoisin sauce before, but I have to say, it is super tasty! 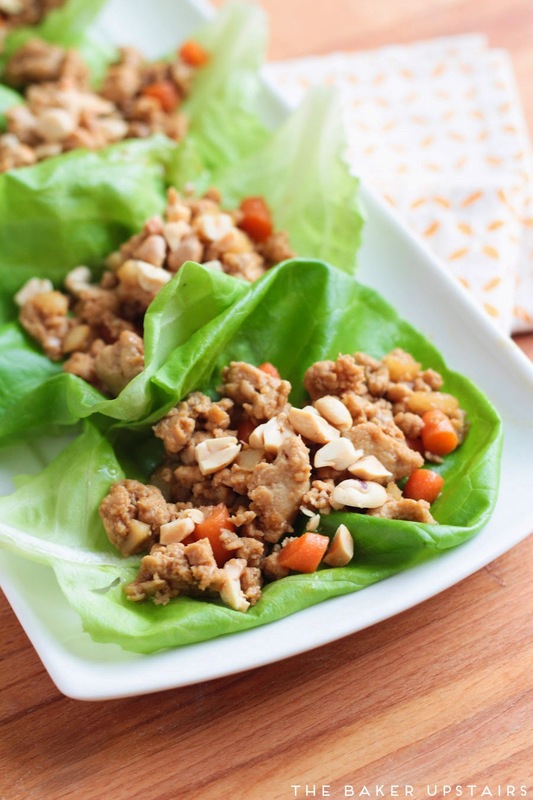 These lettuce wraps have pretty much everything I look for in a weeknight meal: they're super easy, super quick, and super delicious! Heat the oil in a large skillet over medium heat. Add the chicken and cook, breaking apart into small chunks, until cooked through. While the chicken is cooking, whisk together the hoisin, soy sauce, and water. When the chicken is cooked, add the carrots, water chestnuts, garlic, and ginger, and cook for about 5 minutes, until the carrots have softened. Stir in the hoisin mixture and cook 2-3 minutes, until thickened. Remove from heat and let cool slightly before spooning into lettuce leaves. Top with chopped peanuts and enjoy! How about a quick, easy dinner to make your Wednesday a little bit easier? I know making tostadas isn't exactly brain surgery, but I feel like I've been experimenting with them long enough that I've definitely figured out my favorite way to make them. 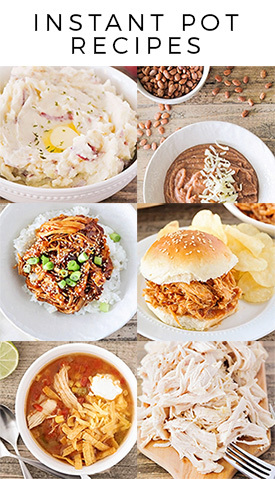 They are one of my family's very favorite meals, and we have them reaaallllly often. I try to always have a batch of homemade refried beans in the freezer for nights that I'm tired and don't want to cook (read: pretty much all of the nights that I work) and these tostadas make for a quick and easy dinner that's usually ready in under 15 minutes. 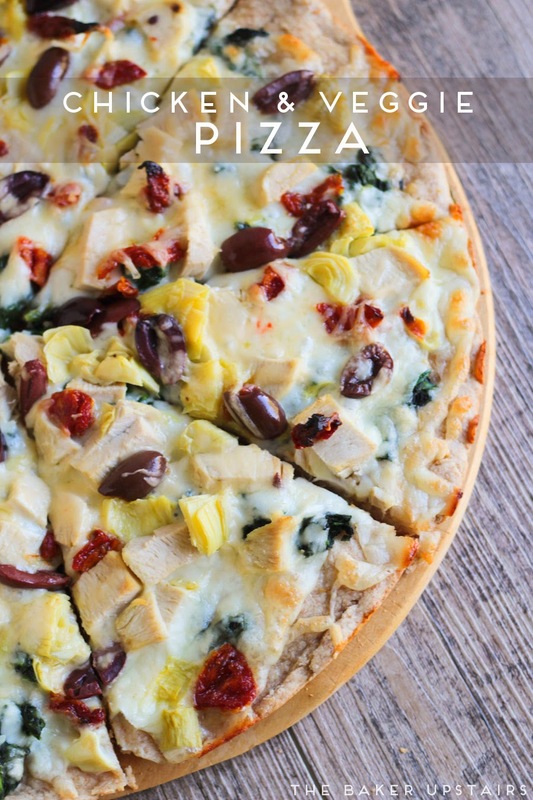 We've experimented with a lot of different toppings but the combination below is my absolute favorite. Each bite is full of so many fun flavors and textures, and they're easy to customize for my one child who won't touch tomatoes and my other child who would die before she ate a piece of lettuce. I think it's definitely worth it to stock up on the homemade refried beans, because they make these tostadas outstanding! Yum! Toss the rotisserie chicken with the cumin, chili powder, and garlic powder. 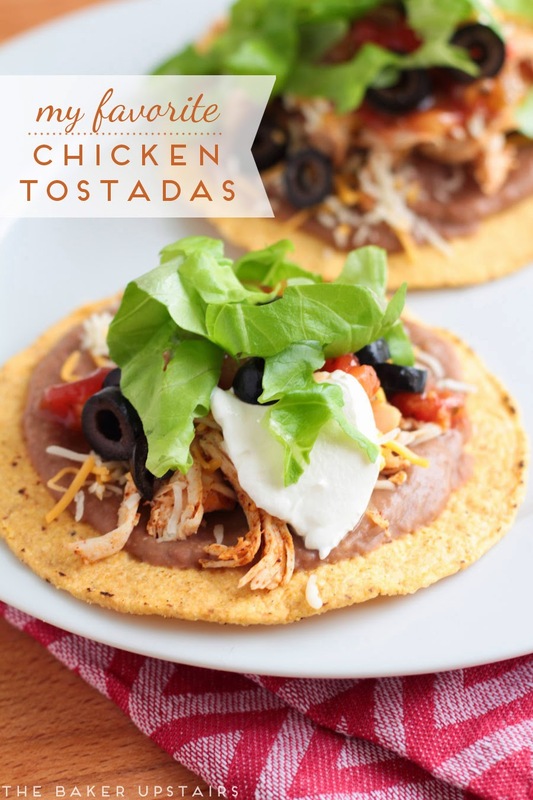 Spread each tostada shell with refried beans, then layer chicken, cheese, salsa, olives, sour cream, and lettuce. Enjoy! Happy New Year! I had the best of intentions to keep posting regularly through the holidays, but it all ended up a bit hit and miss there for a while. However, I did have lots of time over the holidays to have fun with my family, and that's what really matters, right? Geoff has had almost a whole month off of school for the holidays, and it has been wonderful! Abby, my seven year old, had two weeks off, and is heading back to school today. It will be nice to get back into our normal routine and stop with all the holiday crazies, but I'll miss her too. It's always a little bittersweet when they go back to school, right? 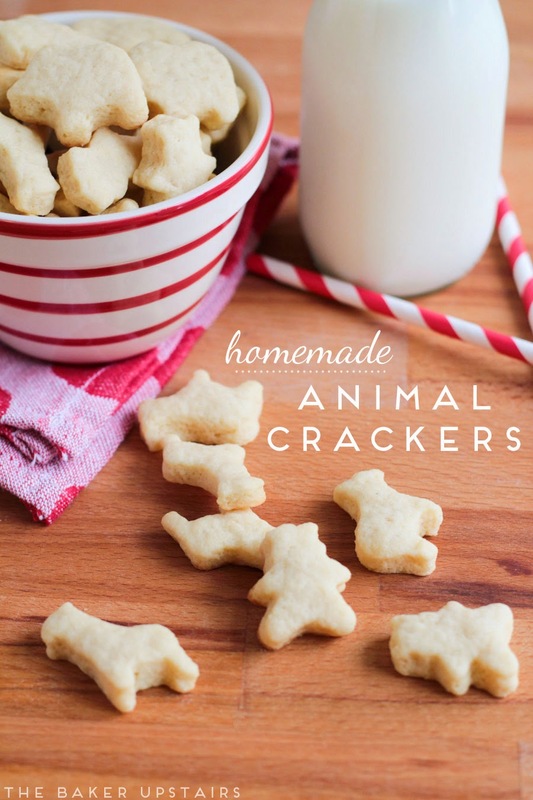 Anyway, with her back at school today, I've been thinking about snacks for her lunchbox, and decided to give these homemade animal crackers a try. They're not exactly the same as the animal crackers you buy at the store, but I think they are definitely more delicious! The texture is sort of halfway between a shortbread cookie and a cracker, and they are buttery and lightly sweetened. My kids could not get enough of these and kept asking for more. I think that next time I make them, I will sub in a little whole wheat pastry flour to make them a little more healthy, but I do really like that by making them myself I know exactly what's in them. 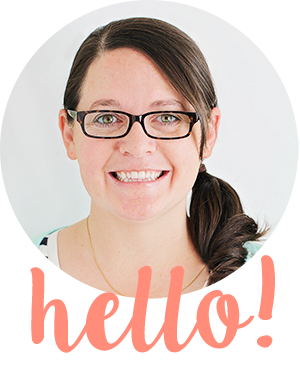 It's so fun to make things from scratch instead of always relying on pre-packaged foods! That's something I am definitely hoping to continue in the new year. I hope you'll try these and see just how great they are! Prepare a large baking sheet by lining with parchment or silicone. In a large bowl or the bowl of a stand mixer, beat the butter and sugar until light and fluffy. Add the eggs and vanilla and mix until blended. Add the flour, baking powder, salt, and nutmeg, and mix to form a soft dough. Roll the dough out on a moderately floured surface to 1/4 inch thick. 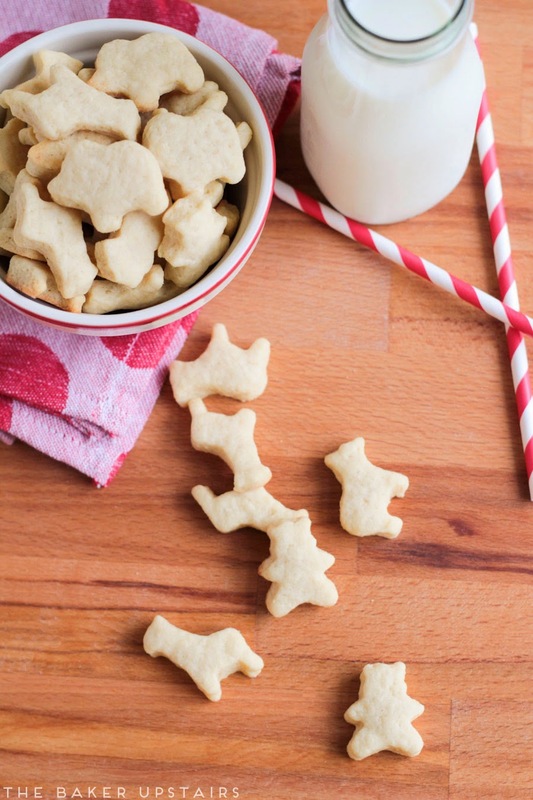 Use small cookie cutters to cut out shapes. (I found this set at Michaels, but this set is also cute!) Transfer cut outs to prepared baking sheet and place the sheet in the freezer. Preheat the oven to 350. When the oven is preheated, remove the baking sheet from the freezer. Bake 8-10 minutes for small shapes and 12-13 minutes for larger shapes.